Through a historic $45 million gift and decades of support, The Meadows Foundation has helped transform Meadows School of the Arts and the Meadows Museum into cultural arts leaders for the 21st century. In March, The Meadows Foundation announced a gift of $45 million to Meadows School of the Arts and the Meadows Museum – the largest single donation to SMU in the University’s history. The momentous gift, along with other generous support provided by The Meadows Foundation throughout the past 20 years, makes the Foundation the only entity in SMU’s history to provide more than $100 million in financial resources to a singular area of focus: the education and promotion of the arts. Since 1995, The Meadows Foundation has provided more than $145 million to the University. Founded in 1948 to “assist people and institutions of Texas,” The Meadows Foundation traces its historic partnership with SMU back to the early 1960s, when Dallas oilman and art collector Algur H. Meadows donated his world-class collection of Spanish art to SMU, along with a $1 million gift to create a museum to house it within the Owen Arts Center. Eugene McElvaney, the chairman of the University’s Board of Trustees in 1962, called the donation “a measure of Mr. Meadows’ deep and devoted interest in the development of a cultural environment in Dallas and the Southwest.” The Meadows Museum opened in the Owen Arts Center in 1965. A few years later, Algur Meadows donated his collection of sculptures by contemporary Italian artists to SMU to establish the Elizabeth Meadows Sculpture Garden, named in honor of his second wife. He also gave a $10 million gift to the SMU School of the Arts, and in gratitude, the SMU Board of Trustees renamed the school Meadows School of the Arts in 1969. The Meadows Foundation marked its 50th anniversary in 1998 by providing a second major gift to SMU totaling $20 million, its largest gift at that time. The purpose: to help create a new, freestanding museum building that would provide an appropriate home for the internationally acclaimed and growing Spanish art collection. The new Meadows Museum, a 66,000-square-foot facility six times larger than the original museum, opened in 2001 just south of the Owen Arts Center on Bishop Boulevard; the opening celebration drew international attention and a visit from the king and queen of Spain. In 2006, The Meadows Foundation gave SMU another historic gift: a $33 million “Edge for Excellence” grant to the Meadows Museum and Meadows School. At the time, it was the largest single grant ever made by the Foundation to any organization and the largest single financial gift ever received by SMU. The gift included $25 million to support goals and programs of the museum, including acquisitions, exhibitions, an educational curator position, an expanded educational program and more. Included in the $25 million was a $5 million challenge grant to match dollar-for-dollar new gifts for acquisition of additional artworks. The Meadows Foundation gift also designated $8 million to support faculty and student recruitment and enrichment at Meadows School of the Arts and to maintain the school’s facilities. 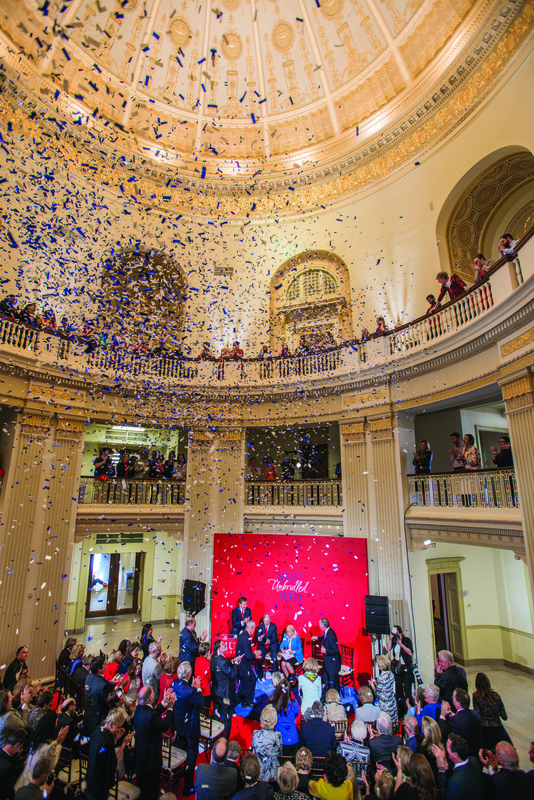 The 1998 and 2006 gifts, totaling more than $50 million, made history for SMU and resulted in unprecedented growth of the school and museum, and also inspired increased awareness and financial support from SMU alumni, philanthropic organizations and the broader community. Thanks to the Edge for Excellence gift, Meadows has successfully recruited and retained world-class faculty and students, strengthened existing academic programs, and established new programs and pioneering curriculum that are helping make Meadows a national model for arts education. The school has also expanded its outreach, resulting in increased engagement and support from alumni, parents, donors and friends. Created seven new endowed faculty positions, including four in art history and the new Peak Centennial Chair held by the director of the Meadows Symphony, Paul Phillips. The school has also recruited international talent to the faculty, including Dr. Zannie Voss, chair of arts management and arts entrepreneurship; Stan Wojewodski, former dean of the Yale School of Drama, now chair of theatre; Will Power, 2011 Meadows Prize winner and now artist-in-residence in theatre; and Stefan Engels, Leah Young Fullinwider Centennial Chair in organ, among many others. Launched the Meadows Scholars Program to provide scholarships that attract the most academically and artistically gifted students to Meadows. The program has grown from 10 students and 12 donors in 2008 to more than 110 students supported by over 125 donors today, and has enabled Meadows to compete with such schools as Juilliard and NYU for the nation’s top arts students. Established the Meadows Exploration Awards, which help fund undergraduate students’ creative activity, scholarship and research beyond the classroom. The awards support new ideas and approaches that result in publications, exhibitions and performances. Established key graduate programs, including a new Ph.D. in art history in 2011, the first art history Ph.D. program in North Texas and one of only a few in the state; an innovative new Master of Management in International Arts Management, in which students spend four months each at three universities, including SMU, HEC in Montreal and Bocconi in Milan, Italy; a new M.A. in advertising; and a new M.A. in popular film and media studies. Opened the innovative Center of Creative Computation in 2010, blending computer science, engineering and art with coursework from both Meadows and the Lyle School of Engineering. Launched one of the nation’s first arts entrepreneurship training programs, offering minors in both arts entrepreneurship and arts management to help students learn how to turn their artistic dreams into sustainable business plans. SMU’s first director of arts entrepreneurship was hired, James Hart, who co-organized the nation’s first Arts Entrepreneurship Educators’ Conference. Held at SMU in 2014, it focused on new pedagogical techniques and formalized the first academic society of arts entrepreneurship educators. Meadows’ groundbreaking curriculum also attracted the attention of alumna Jane Chu (’81), new chairman of the National Endowment for the Arts, whose visit last fall is helping the NEA explore how to support arts entrepreneurship on a national scale. Established an initiative in arts and urbanism, Ignite/Arts Dallas, to support local arts groups and train students in ways to weave together cutting-edge art practice, urban sites and diverse audiences. Launched the National Center for Arts Research (NCAR) in collaboration with national partners including the Cultural Data Project, National Endowment for the Arts, Theatre Communications Group and others, and brought in the first NCAR Fellow, Kate Levin, former cultural commissioner of New York City. NCAR is providing data-driven insights to help arts organizations nationwide overcome challenges and increase impact and has drawn global attention for its work. Repurposed the Meadows Award, originally established in the early 1980s with Meadows Foundation support to honor artists at the pinnacle of their careers, into the Meadows Prize. Launched in 2009, the Meadows Prize is a new international arts residency that brings emerging, pioneering artists to SMU for several weeks to interact with Meadows students and collaborating arts organizations and to leave a lasting legacy in Dallas. Expanded outreach through an award-winning Start a Movement student recruitment campaign; launch of a new alumni magazine, MPRINT; an improved website; working with the respected national arts publicity firm of Resnicow + Associates; and other initiatives. The Edge for Excellence grant has also enabled SMU Meadows to increase its permanent endowment by $20 million through generous support from alumni and friends over the past eight years. The Meadows Museum has also changed dramatically since its new building opened in 2001. Meadows Foundation support has made possible enhanced exhibitions, acquisition activity, innovative educational programs and a historic partnership with the Prado Museum in Spain, helping the museum grow from a regional university art collection into an internationally recognized museum of Spanish art, with world-class exhibitions, research, publications, outreach and a growing profile on the world’s art market. Launch of a historic partnership with the Prado Museum in Madrid, the first such international program for Spain’s national museum. The multifaceted collaboration includes annual loans of major paintings from the Prado, interdisciplinary research at SMU, an unprecedented fellowship exchange between the two museums and a range of public programs. Creation of two fellowships with the Prado – the pre-doctoral Meadows/Kress/Prado and post-doctoral Meadows/Mellon/Prado – allowing young professionals experience at each museum. No other American fellow has this opportunity in Spain. New collaborations with major museums world- wide, including the National Gallery of Art in Washington, D.C., Museum of Fine Arts in Boston, National Gallery of Art in London, Thyssen-Bornemisza Museum in Madrid and many others, and a program to exchange masterworks with the Louvre Museum in Paris and Kunsthistorisches Vienna. Collaborations with owners of renowned private collections, including the Abelló and Alba families, to host exhibitions of their works – many of which have never before been seen outside of Spain. Significant increases in the number, quality, range and scholarly depth of exhibitions. National and international museums now consider the Meadows a partner and ask to join in their exhibitions. The Meadows Museum has spearheaded groundbreaking exhibits with partners, such as Diego Velasquez: The Early Court Portraits, and developed and coordinated acclaimed traveling exhibits such as Sorolla and America. Meadows Foundation support has made possible enhanced exhibitions, acquisition activity, innovative educational programs and a historic partnership with the Prado. Major acquisitions, thanks to matching funds provided by The Meadows Foundation, including Jaume Plensa’s Sho and Goya’s Portrait of Mariano Goya, among many others. Hosting of the American Association of Museum Directors annual conference for the first time, in 2014, providing national visibility for Meadows Museum initiatives. The remarkable growth and transformation of the Meadows School and Meadows Museum made possible by The Meadows Foundation is now poised to continue into the next decade, thanks to the extraordinary $45 million gift announced in March. It is the largest grant in The Meadows Foundation’s history. The new gift includes $25 million to support goals and programs at the Meadows Museum. It designates $13 million for exhibitions, education programs and initiatives, $6 million for acquisitions and $6 million for an acquisition challenge grant. In addition, the gift will help the museum expand relationships with international cultural institutions and increase the number of visitors. The Meadows Foundation gift also designates $20 million to the Meadows School to support its goal to lead the nation in arts and education. The funding will be used to continue to attract and retain top faculty and students, create and maintain innovative programs of national importance and provide enhanced studio, gallery and state-of-the-art classroom spaces. The gift designates $12 million for facility enhancements, including a $10 million challenge grant, targeted to renovating the visual arts wing and other areas of the Owen Arts Center. It also includes $8 million for student and faculty recruitment and retention as well as new strategic initiatives, providing support in such areas as faculty research and travel, student Exploration Awards, new programs such as NCAR and innovative curricula such as the arts entrepreneurship program.